Wednesday, May 25, 2016 – Highlands, NJ – It was a busy weekend for Dime Racing driver Frankie Montecalvo who was in a race against the clock in more ways than one. 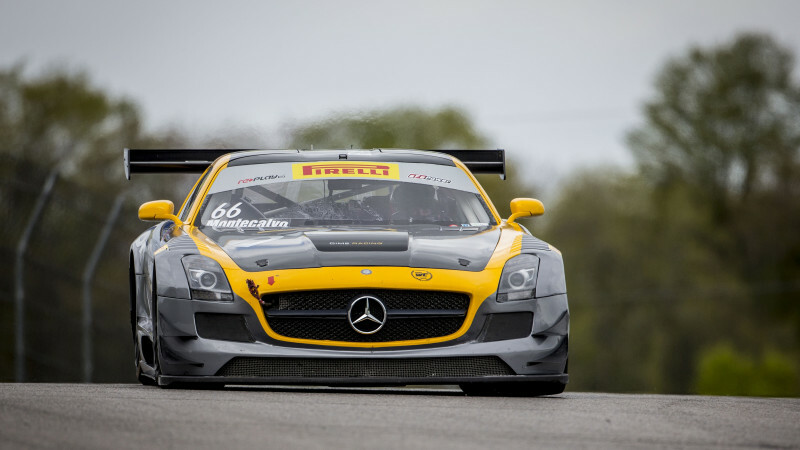 Montecalvo started the Canadian Tire Motorsport Park weekend testing the Dime Racing Mercedes AMG GT3 at the Bowmanville track on Thursday. He also completed the Friday morning practice, but then raced his way back to his home state of New Jersey to make his sister’s rehearsal dinner and wedding the following day. The timing of Round 8 in the Pirelli World Challenge Championship coincided with his sister’s wedding, and unfortunately Montecalvo was unable to make it to Saturday’s race. However, when Sunday morning rolled around, Montecalvo was on the first flight out of Newark International Airport to Toronto, where a Dime Racing team member was waiting to pick him up and get him to the track in time to compete in the second race. Since Montecalvo was unable to race in Saturday’s competition and qualify for Sunday’s race, he had to start from the back of the field, but that didn’t stop Montecalvo from charging his way past the competition and onto a podium finish. “The weekend started out really well. The car was good for the most part during the practice sessions, and I was happy with our times and the way the car felt going into the race,” explained Montecalvo. When the race was finally green flagged, Montecalvo wasted no time making up several positions and found himself second in class for nearly half of the race. Rounds 10 and 11 of the Pirelli World Challenge Championship will be held this weekend at Lime Rock Park in Lakeville, CT. The GTA class did not race there in 2015, so this will be the first time Montecalvo has raced at the 1.5-mile road course since 2011 when he raced there in the CORE Autosport PC car. Because the track is so short and the cars can reach speeds that enable them to go airborne on certain stretches of the circuit, the Pirelli World Challenge officials have elected to run the version of the track that includes a chicane before a fast, uphill, right-hand turn to slow the cars and will likely prevent them from becoming airborne. You can watch Frankie race LIVE on Friday, May 27 at 4:55 PM EST and again on Saturday, May 28 at 4:00 PM EST at www.world-challenge.com/streamvideo/ And catch the re-air on Sunday, June 5 on CBS Sports Network at 4:00 PM EST.